with chants, work songs, games and gospel songs. The Quimbys have toured throughout the world, including performances at the Olympic Games in Mexico and Lillehammer, sharing their songs and stories set against the history and mystique of the Georgia Sea Islands. Their audiences include universities, schools, museums, conventions, conferences, as well as numerous radio and television appearances. The Quimbys performance exalts in remembering and keeping alive two centuries of African-American folk heritage. The Georgia Sea Island Singers continue a tradition begun almost a century ago on St. Simons Island, Georgia, for the purpose of preserving the rich reservoirs of African-American culture, customs and the songs of the Gullah language spoken on the isolated islands of the Georgia Coast. These islands have been a vital storehouse of African-American history, because people living here were cut off from the melting pot on the mainland and retained a more pure version of the games and songs brought over from Africa. Songs and traditions documented by Lydia Parrish in her 1942 book"Slave Songs of the Georgia Sea Islands" are performed today by the Quimbys for audiences all over the world. The Quimbys travel throughout the world most of the year, performing Slave songs and dances, describing the world of their own Slave ancestors, leading children in games, demonstrating slave dances, singing Slave Songs a capella, and explaining what those songs meant in the context of the last century. "I'm a firm believer that you can't know where you're going until you realize where you've come from" Frankie explains, "We have dedicated our lives to trying to preserve that rich heritage and culture that our ancestors handed down to us." Slaves were not allowed to have musical instruments, so the Quimbys sing a cappella or with only the accompaniment of rythym instruments, like the tambourine. Songs and dances took their impetus from the many things Slaves dared not say to the master, and from the things they dared not do. "Hambone, Hambone, Where You Been" was one of Doug's most frequently requested songs. It was a memorable performance - his lightening quick hands elicit resounding sounds from his thighs, chest and mouth as his own body became a musical instrument. Hear the musical, lyrical language of Gullah, a mixture of English and African dialect that bears the characteristic rapid enunciation of some African tribes. Learn the art of hand-clapping and the choruses from the many call-and-response songs. The Quimbys offer an overview of Black History as they explain the meaning of the coded messages behind the songs and games, such as "The Old Tar River" (.aiff 38k) (.wav 38k) and the role they have played in the history of their people. 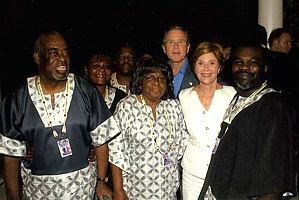 Dressed in brilliant dashikis, the Sea Island Singers share their stories along with a captivating history of the coastal islands of Georgia, bringing warmth and joy to this dynamic cultural experience. Frankie Sullivan Quimby was born and raised on the Georgia Sea Islands. Her family took the name Sullivan after the Emancipation, one of the few families who can trace their ancestry back to a specific spot in Africa. The Sullivans, members of the Foulah Tribe, came from the town of Kianah in the District of Temourah in the Kingdom of Massina, on the Niger River. Frankie, the oldest of thirteen children, is descended from slaves on the Hopeton and Altama Plantations in Glynn County. 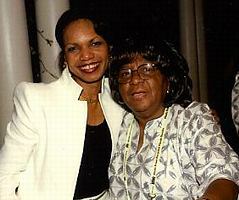 Many of her relatives still live in the Brunswick, Georgia area and on St. Simons Island. Frankie is often quoted as saying "We are a strong people who know how to survive...and we want everybody to know where we came from." Doug Quimby started singing at the age of four. He was born in Baconton, Georgia in 1936, where his family were sharecroppers earning as little as $9.25 for an entire year of work. Douglas and his wife Frankie shared a common musical heritage though they grew up miles apart. Doug's grandfather spoke in the Gullah dialect, indicating that many of his ancestors worked on the coastal plantations before being sold to inland landowners. In 1963 Doug joined the Sensational Friendly Stars, a well-known gospel group, and six years later he became a member of the Georgia Sea Island Singers. Sadly, Doug passed in August 2006. Thomas (Tony) Merrell has been a member of the Georgia Sea Island Singers for ten years. Born in Fort Valley, Georgia, Tony has made his home in Brunswick for the past 43 years, where he built and owns his own mechanic shop. 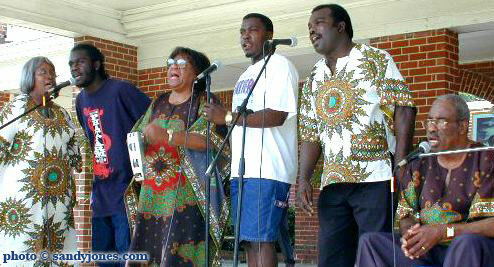 In 2001, he closed his shop in order to travel and carry on the heritage of the Sea Island Singers. As a background member of the group, Tony has been learning the dances, history, and culture of his ancestors. 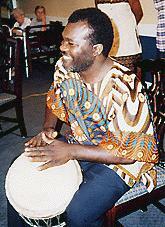 He is now becoming one of the lead performers, specializing in rhythmic demonstrations and the performances of a number of different drums, including the jimbay drum, talking drum, and stick box drum. Especially While in the Georgia Coast! Also - Conventions & Festivals - Weddings a Specialty - "Jump the Broom"
THE GEORGIA SEA ISLAND SINGERS appearances and special events have included: Performed for President & Mrs. Bush, National Security Adviser Condoleezza Rice & others at the Sea Island Georgia G8 Conference, June 2004  Represented the U.S.A. at the Winter Olympics in Lillehammer; represented the Southern Coastal U. S. A. in West Africa at the invitation of the President of Sierra Leone  Represented State of Georgia at Statue of Liberty Centennial, New York  represented U. S. A. at Philadelphia Folk Festival  represented U. S. A. at International Children's Festival, Vancouver, Canada  Inauguration of President Jimmy Carter  White House Concert at invitation of President Ronald Reagan; Carnegie Hall, New York City  Olympic Games, Mexico  Mariposa Folk Festival, Toronto, Canada  Smithsonian Institute, Festival of American Folklore  Wolf Trap International Farm, Alexandria, Virginia  National Storytelling Festival, Jonesborough, Tennessee  Music Center of Los Angeles - Performing Arts Center  Southern Order of Storytelling, Atlanta Historical Society  Learning Circle Montessori School, Bozeman, Montana  Whaling Church, Martha's Vineyard, Massachusetts  Prairie Home Companion, Minneapolis, Minnesota  North carolina Museum of Art, Raleigh, North Carolina  Old Town School of Music, Chicago, Illinois; Portland Art Museum, Portland, Oregon  Harvard University, Boston, Massachusetts  Hudson River Revival Festival, New York City  East West Culture Center, Honolulu, Hawaii  National Association for Music Therapy, Conference - Atlanta, Georgia  Ohio Music Education Association, Conference - Dayton, Ohio  American Orff Schulwerk Association, National Conference.